Yes NZ Motorsport "reluctantly" allowed the FIA approved rollbar. hi there, i am also in nz and just got a 211 in a deal i did. it arrives in a week or so, the question i have is does the factory roll cage comply with motorsport nz? or do you have to change anything? i would apreciate any help. deon. Yeah but think of the weight saving..and thats my watch wearing arm too! Its a relief to see I'm not the only guy with this issue. I forgot to mention that I have also fitted the smaller wheel, but this doesnt really make a difference. The only permenent solution to the problem is using a hack saw..I just wonder if anybody would notice. 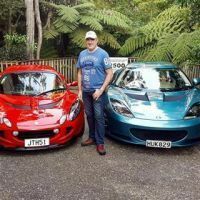 Lotus owners in New Zealand - any ? Something that has always annoyed me with the 2-11 and I wondering if anybody else has the same issue. I find the rollbar (on RHD models) gets in the way with my right arm especially on left hand turns. This is my issue with the 2-11 ...its just NOT fast enough. Its quick off the line, but I get seriously dealt to in a race here. My class has Junos, Radicals etc, and Im mid field at best. Maybe its me...but I just cant get the staight line speed> I have the rigid tonneau and the upgraded ECU, and this makes it nicer to drive. I feel the 2-11 needs 300 HP+. There are hardly enough Lotus's in NZ to warrant a Lotus only race. Help...My 2-11 has a developed a flat spot between 3-4000 rpm. The engine has a "miss" akin to an F1 car entering the pits (thats the only way I can describe it). When the engine is missing ,my T/C light on the dash is flashing!!!. If I engage the T/C the miss disappears. I have recently upgraded the ECU to the lastest 260hp hoping this would fix the problem, but its still there. Does anybody know what could be causing this? Is anybody on the forum aware of a model manufacture who has made a Lotus 2-11, preferably in Launch edition colours?? I'm running Dunlop Formula Direzza O3G, for me these work far better than the A048 because there working when cold ie the first corner!! The A048's require some temperature for them to come up to speed (no pun intended). For hill climes Im running sticky Hooziers - slicks with three grooves, and they are road legal here..well sort of officer.